North Korea will almost certainly be able to reach UK shores with an intercontinental ballistic missile within six to 18 months, MPs have said. 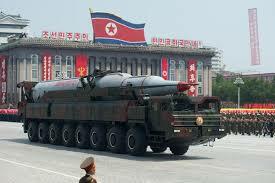 However, the Commons' Defence Select Committee report said there was as yet no evidence that North Korea could arm these missiles with nuclear warheads. MPs, who have been investigating the threat posed by North Korea, added that such a strike seemed "highly unlikely". They described the country's ruler, Kim Jong-un, as "ruthless but rational". He was "ruthless, like other Communist dictators before him, but he is rational" and could be "dissuaded from the use of nuclear weapons, by means of a policy of deterrence and containment", the report said. North Korea has carried out six nuclear tests, and has a ballistic missile that experts believe could put the whole of the US in striking range. In doing so, Pyongyang said it had achieved its mission of becoming a nuclear state. However, last month, after months of mutual hostility, Mr Kim was said to be "committed to denuclearisation" as he and US President Donald Trump agreed to talks, in an unprecedented move. Despite the developments, the MPs' report said North Korea was unlikely to abandon its weapon programme and would achieve its goal of posing a nuclear threat to its opponents soon. The committee said a North Korean nuclear strike against the UK seemed "highly unlikely", given its focus on threatening the US. "It is obvious to North Korea that launching such weapons would lead inescapably to devastating military consequences," the report goes on. If there were conflict in the region, the UK was unlikely to stand aside and would assist the US, it said. The MPs' report issued a further warning that the UK could be the target of cyber attacks from the regime. North Korea was believed to be behind last May's WannaCry attack, which affected NHS hospitals, businesses and banks across the world causing billions of dollars of damage. Committee chairman Julian Lewis said the threats posed by the regime were typical of the intensifying dangers confronting the UK and underlined the need to spend more on defence. He told the Media he wanted to see spending increased from 2% of GDP to nearer 3% to cope with new cyber and nuclear threats, as well as older ones.